While wildfires are not frequent in the area, when do occur, it’s important to understand the magnitude of the potential public health impacts from the fires. 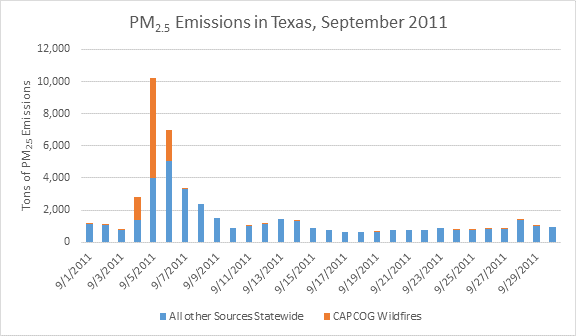 Wildfires in the Central Texas region on September 5, 2011, accounted for 21% of all nitrogen oxides (NOX) emissions statewide, 33% of all volatile organic compounds (VOC) emissions, and 61% of all fine particulate matter (PM2.5) emissions. In September 2011, sparks from damaged power lines ignited a wildfire that would become the most destructive wildfire in Texas history. 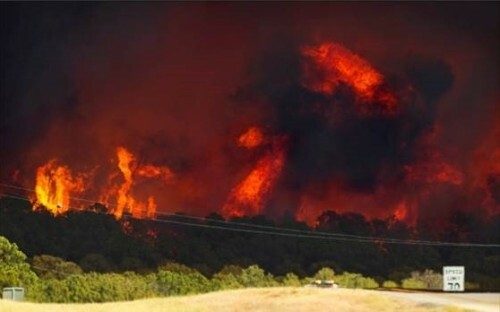 The Bastrop Complex Fire, which burned from September 4, 2011 – October 10, 2011, claimed 2 lives, caused $325 million in damage, including destroying over 1,600 homes and 40 commercial structures. Over 34,000 acres in Bastrop County, scorching more than 6% of the total land area of the county. Across the state, a total of 4,064 fires burned 300,279 acres during September 2011. One of the hazards of wildfires that can often be overlooked is the air pollution and the health impacts of that pollution. A conservative estimate of the public health impact from wildfires emissions suggests that there was a $500 million public health impact from increased PM2.5 and ozone concentrations due to the September 2011 wildfires in the Central Texas region beyond the $325 million in property damage. While wildfires are not frequent in the area, when do occur, it’s important to understand the magnitude of the potential public health impacts from the fires too, and to take steps to both minimize the risks of wildfires and ensure that schools, nursing homes, and health-care providers get timely information about wildfires and smoke plumes when they do occur and to account for air pollution impacts from wildfires when emergency managers conduct planning for how to address wildfires.